Outfielder of the French light infantry in Mexico. Home » Outfielder of the French light infantry in Mexico. French light infantry voltigeur, Mexico. 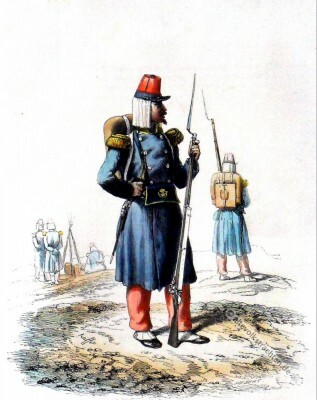 Outfielder of the French light infantry in Mexico 1861. Infanterie légère d’une compagnie de voltigeurs (Mexique). The French intervention in Mexico was an intervention of France in the internal affairs of Mexico. The aim was to install a dependent of France monarchy. Adrien Pascal (1815-1863) was a French military historian. He was the head of department of advertising at the Imperial Commission of the Universal Exhibition of 1855. Philippoteaux, Félix Henri Emmanuel (French painter, engraver and illustrator, 1815–1884). This entry was posted in 1861, 19th Century, France, Mexico, Military and tagged French military uniforms, Histoire de l'Armée on 11/4/15 by world4.